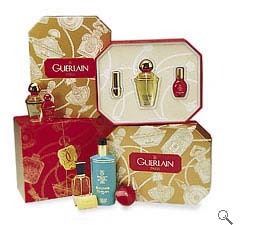 To create holiday gift packaging which contemporizes Guerlain's image for the U.S. market while reinforcing their 200 year-old European heritage. A new visual identity illustrating the company's extraordinary range of fragrances is applied to pre-packed and custom gift sets. Though initially developed for Christmas, the graphics are extended to a wide range of year- round gift apparel and merchandise.